Shares in Kodak have fallen after a ruling by the International Trade Commission that one of its digital imaging patents is "invalid". 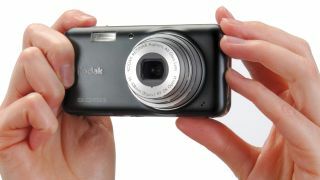 It comes after Kodak filed a claim against Apple and RIM, which makes Blackberry devices, relating to the way images are previewed when shooting in Live View. The original patent was filed in 1997, but the ITC has said while Apple and RIM did indeed breach that patent, the innovation is too "obvious" to be considered a valid patent in the first place. Kodak, which filed for bankruptcy protection back in January, is in bullish mood still, stating: "We are pleased the ALJ [Administrative Law Judge, for the ITC] has concluded that Kodak's patent is infringed by Apple and RIM. "We expect to appeal to the full Commission his recommendation on validity. The ALJ's recommendation represents a preliminary step in a process that we are confident will conclude in Kodak's favor"
The once giant imaging manufacturer has a huge inventory of digital imaging patents, as it was Kodak which invented the first digital camera sensor. In recent years, as times have been harder on the US based corporation, it has taken to licensing or selling off those patents to generate income. This particular patent has already been licensed to Samsung. Shares in Kodak took a tumble after news of the judgement, as it could also have an affect on several of Kodak's other patents. It seems hardly a week goes by when Kodak isn't suing, or being sued, by someone. Recent examples include Apple suing the firm over printing technology, while Kodak was thought to be teaming up with HTC to take on the mighty Apple. Kodak announced earlier in the year that it was to stop making digital cameras and concentrate on its printing business. The latest troubles will surely leave some wondering whether the firm can carry on at all.